Tehran Metro transports two million people each day, according to Tehran city officials. Reports indicate that peddlers frequenting the system to sell their goods sometimes exceed the number of travelers. With the skyrocketing inflation and the ongoing economic crisis in Iran, it is no longer too far fetched to believe that most of the people on the metro are peddling some goods. Household expenses have gone up by 30 percent in the past year forcing people to find alternative modes of income generation. Before the peddlers used to be more migrants from Afghanistan, Pakistan or Iraq, now Tehran residents and migrants from other parts of Iran are also a significant part of Tehran Metro peddlers. In recent years, some university students have also taken up peddling goods on the metro in order to generate their dorm, transportation and other expenses. 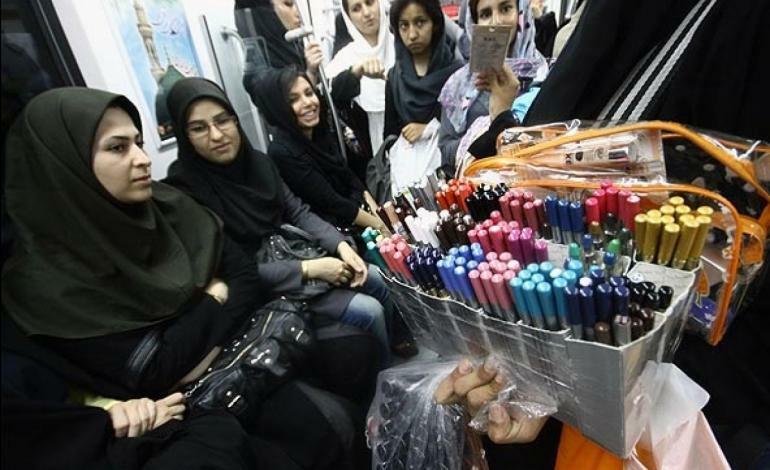 Reports indicate that over two thousand women used Tehran Metro to sell goods. Since women have their exclusive wagons in the metro, peddling goods in those wagons creates an exclusive market for women. The women’s wagons present a safe and independent workplace for female peddlers where they can work relatively free of the discrimination and pressures faced by women in public workplaces. The municipal government has often spoken of organizing the unregulated vendors in Tehran Metro by providing stands in the various locations of Metro premises; however, the rental charges for these stands keeps the peddlers away although it means they constantly run the risk of product seizure, confrontation with security officers and even arrest. I ran after her and bought a couple of bars to get her to speak to me. As I reached for my wallet, I asked her if she usually worked there. She responded: “No, it is the beginning of the term and I need to make enough for my dorm expenses.” She told me that she is twenty years old and was accepted into the literature department of Tehran University two years ago. She leaves her family in Mashhad to attend university in the capital but her dreams of higher education and a better future are challenged by the skyrocketing prices in Tehran. She told me that her family does not know that the money they send her does not cover her expenses and she does not tell them that she has to work to make up the difference.